This summer, vacation travelers are more likely to stop to use the bathroom than any other activity, including buying gas or food and drinks, according to results of a nationwide consumer survey conducted by the National Association of Convenience Stores (NACS). Nearly three in four American drivers (72%) say that they stop to use the bathroom when driving on a vacation, compared to 68% who purchase gas and 66% who buy food or drinks. Female drivers are more likely than male drivers to stop to use the bathroom (77% vs. 66%). 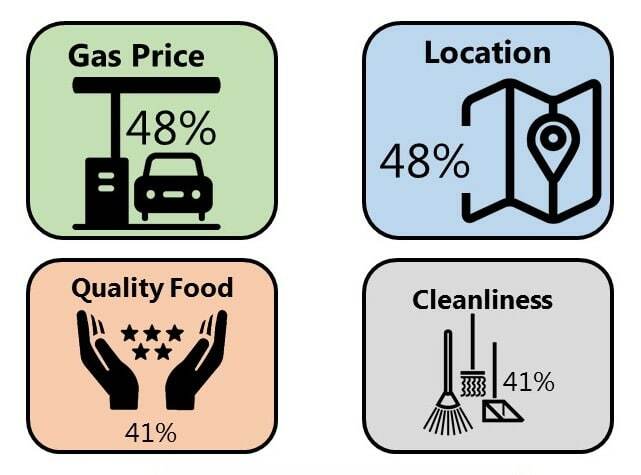 Vacationers are also particular about the stores that they visit: 41% say that cleanliness and bathrooms influences their decision to visit a store, an increase from 36% who said so two years ago. Overall, the top two reasons that drivers say they select a place to stop are the gas price and the proximity to the area that they want to stop (48% for each). Quality food options was tied for third with bathrooms at 41%. Nearly three in ten Americans (29%) say that they will take more time on vacation trips this summer and 86% of these vacationers say that they will travel by car. Vacationers are more likely to travel out of state (38%) than in state (26%). Affordability is the primary reason the vast majority of vacationers plan to travel by car, cited by 59% of drivers. That’s up from 54% two summers ago, when gas prices averaged more than $3.60 per gallon. Two thirds of drivers in the Midwest (67%) cited affordability as a main reason to drive by car. The ability to spend time with family was the second most-mentioned reason to travel by car, cited by 45% of Americans. However, there was a noticeable split by gender: while 51% of females say that car travel allows them to spend more time with family, only 39% of men say the same. Wherever they’re headed, millions of Americans will be stopping and going inside convenience stores as part of their vacation. The top reasons that they will go inside a convenience store are to use the bathroom (70%), buy a drink (63%), buy a snack (57%) or buy a sandwich or other meal (26%). One in eight drivers (13%) say that they will not stop at a convenience store or gas station on their summer travels. Overall, 17% of American drivers say that they are driving more because of low gas prices. Younger consumers ages 18 to 34 are most likely to say that gas prices allow then to drive more (29%) and older drivers ages 50 or more are least likely (6%). Overall, nearly nine in ten consumers (89%) say that low gas prices are good for the U.S. economy, down slightly from the 91% who indicated so in 2015.